Understand your Lightning Experience rollout options. Enable Lightning Experience for your organization. Based on our experience and those of the thousands of customers who have fully moved to Lightning Experience, we’ve identified the key activities and best practices that support a successful transition from Salesforce Classic. Use this framework to determine the steps that make sense for your company and to develop your plan for rolling out Lightning Experience. Depending on the size of your organization, you could be working with a Change Management department or have a project manager assigned to the transition. Or perhaps you’re the one charged with organizing and executing the transition from start to finish. 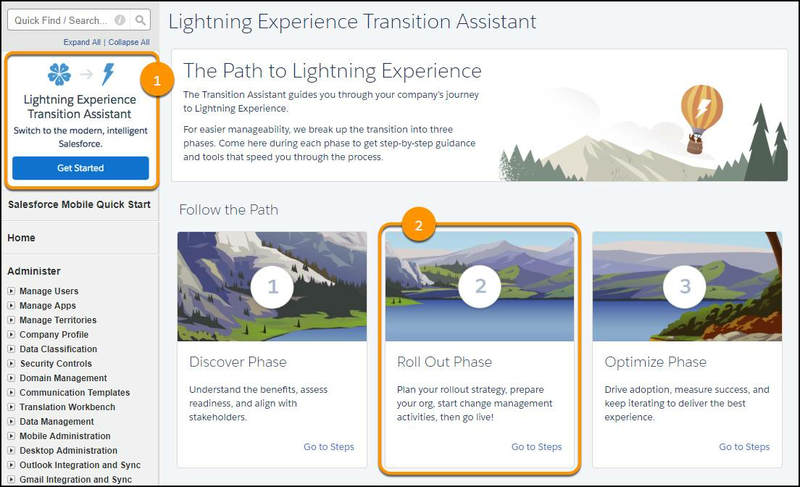 However the work gets divvied up, use the Lightning Experience Rollout module to help define your overall rollout strategy. At this point, you’ve evaluated the benefits of Lightning Experience and are ready to deploy to some or all of your users. Next, we’ll walk you through the technical steps to prepare for and enable Lightning Experience for your users. We recommend enabling and setting up these unique-to-Lightning Experience features, so your users get the full power and productivity benefits of the new interface. Give users an easier, more efficient way to keep track of current and past activities. All the key details for each task, meeting, logged call, and sent email are bundled together, right on the page with other record details. Represent activity relationships more accurately by letting your sales reps relate multiple contacts to individual events and tasks. Shared Activities is forever. After the feature’s enabled, it can’t be disabled. Help your users stay organized with our enhanced note-taking tool. It’s a breeze to create rich-text notes and quickly relate them to specific records. When you turn on Enhanced Notes, remember to add the new Notes related list to page layouts. Adding the Notes related list lets your users create and read notes directly from their records. Leverage the rich features and flexibility of Salesforce Files from standard Salesforce objects and your custom objects. Add the new Files related list to page layouts. Adding the Files related list lets users upload files to records, see files associated with records, and quickly page through files in the visually rich preview player. To work more efficiently or close more deals, help your users adopt your company’s processes.. Set up a process based on an object’s status or stage. Add guidance for success at each step in the process. Give your reps instant access to relevant, timely news about their accounts, contacts, leads, and opportunities. This feature is available only in English, so if your org uses a different primary language, consider whether you want this option. Give your users everything they need to manage their day from the Lightning Experience Home page. Sales reps can see their quarterly performance summary and get important updates on critical tasks and opportunities. You can also customize the page for different types of users and assign custom pages for different profiles. To alert users when they’re about to create a duplicate record, create duplicate rules. Duplicate rules establish whether and when users can create duplicate records in Salesforce. Keep the sales process moving by letting your sales reps convert qualified leads to contacts. At the time of conversion, sales reps select an account for the newly created contact, or create an account if it’s not yet in Salesforce. Reps can also create an opportunity on the spot. Add the Convert button to the Lead page layout. Help users work more efficiently by giving them access to all the data and tools they need. What’s most important to sales reps? Accounts, events, and organizations. How about sales managers? Reports and dashboards make the top of the list. Lightning apps take things to another level past Classic apps by letting you brand your apps with a custom color, logo, and utility bar. Have users in fast-paced environments like call centers or contact centers? Console apps are perfect for these situations. Users can view multiple records and their related records on the same screen, and quickly work through records from a list using split view. It’s easy to jump back-and-forth between lists and records without losing track of what you’re working on. Create a subdomain with the Salesforce My Domain feature. A My Domain subdomain helps you manage login and authentication. Set up a My Domain subdomain to use Lightning components in Lightning component tabs, Lightning pages, the Lightning App Builder, and standalone apps. To set up a subdomain in your production org, see the User Authentication module. My Domain is already turned on in all Trailhead Playgrounds. Do not attempt to turn on My Domain, or change its settings, in your Trailhead Playground. We review some of these features in more depth later on. 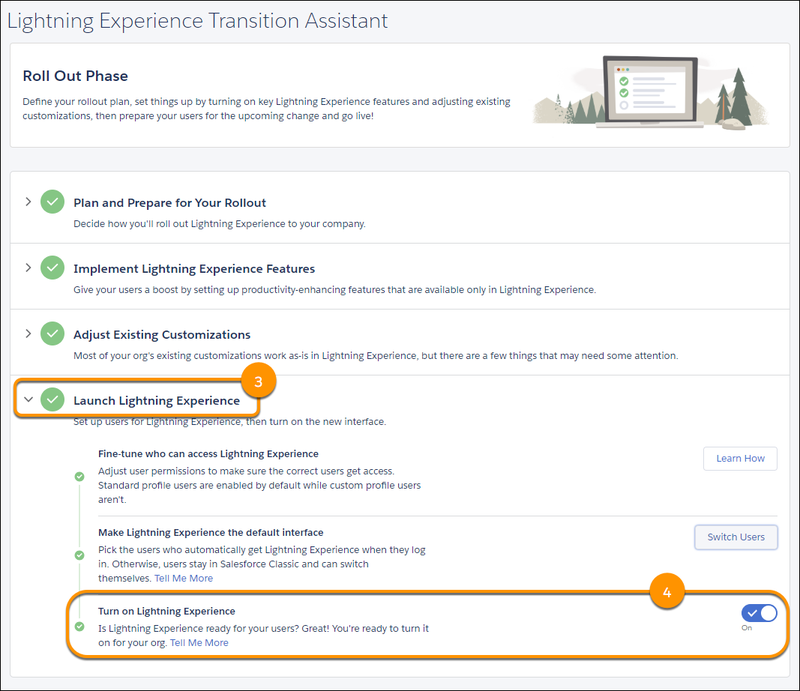 You can enable some of these recommended features from the Lightning Experience Transition Assistant, which you can find in Salesforce Classic Setup. Just look for the Lightning Experience Transition Assistant tile at the top of the Setup menu. Next up, make sure that the right users can access Lightning Experience when it’s turned on. You can fine-tune access with permission sets and custom profiles. Meaning you can do a phased rollout, starting with a small pilot group or a specific team of users who can benefit from the new interface. Or go for it and set your entire organization loose. You can also control who immediately switches to the new interface, who stays in Salesforce Classic until they switch themselves, and who can’t switch back to the classic interface. The power is yours. Okay, if you use Essentials or Group Edition, that’s overstating things. You can’t remove the Lightning Experience User permission from your org’s standard profiles, and custom profiles aren’t available. So it’s “all or nothing” in Essentials Edition and Group Edition—all your users get access when Lightning Experience is enabled. But you can control who switches immediately to the new interface and who remains in the classic interface until they’re ready to switch themselves. Users require the Lightning Experience User permission to access Lightning Experience. By default, this permission is automatically enabled for all users with a standard Salesforce profile. Custom profiles don’t automatically include the permission. So first things first, do you have users with standard profiles who you don’t want accessing Lightning Experience yet? Move these users to custom profiles that don’t include the Lightning Experience User permission. For users assigned to custom profiles, decide who gets Lightning Experience access now and who you’ll set up later. Consider these options. Want to test Lightning Experience with a small group of custom profile users but you don’t want to turn it on for everyone assigned to these profiles? Create a permission set that includes the Lightning Experience User permission. Then apply the permission set to each pilot user. When you turn on Lightning Experience, only pilot users see the new interface. Interested in rolling out Lightning Experience to everyone assigned to specific custom profiles? Or ready to enable all your custom profile users? Adding the Lightning Experience User permission to profiles is the fastest way to mass-enable the new user interface. If you’re a Data Loader ninja, you can save time by updating many profiles at once. But remember, with great power comes great responsibility. Take care you don’t inadvertently enable or disable other features. If you’re limiting Lightning Experience to a subset of your users, try to keep all members of a functional team on the same experience. If you have team members who often share links and work closely together, include them all in your pilot. See Considerations for Switching Between Lightning Experience and Salesforce Classic for more details. When Lightning Experience is turned on, users who have the Lightning Experience User permission remain in Salesforce Classic. These users automatically get the Switcher, so they can switch themselves to the new interface when they want. After Lightning Experience is turned on, things change. From this point, when users are assigned the Lightning Experience User permission, they get Lightning Experience by default. This is true for all new users who are assigned a standard profile or a custom profile that includes the user permission. It’s also true for existing users if their profile is updated to include the user permission. These users still get the Switcher so they can access Salesforce Classic. Leaving users in Salesforce Classic and letting them switch to Lightning Experience on their own can be a good option if you want to turn on the new interface now but your team isn’t fully trained yet or it’s not a good time for a major change. But when you’re ready for users to call Lightning Experience home, there are several options for driving adoption. Choose what’s right for each user. 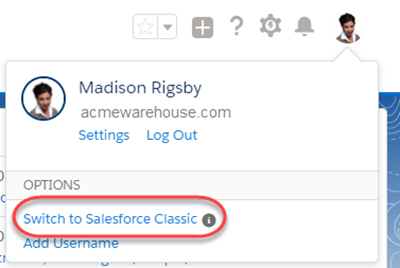 Lightning Experience-enabled users who get Salesforce Classic by default can use the Switcher to access the new interface when they’re ready. This may be the best option if you want to turn on Lightning Experience now but your team isn’t fully trained yet or it’s not a good time to introduce a major change. For users who are trained and ready to go, make Lightning Experience their default experience. These users also get the Switcher, so they can return to Salesforce Classic if needed. See Switch Users to Lightning Experience. Encourage users to stay in Lightning Experience by automatically switching them to the new interface on a daily or weekly schedule. These users can return to Salesforce Classic, but they’ll keep getting switched back to Lightning Experience at the next scheduled interval. See Encourage Users to Stay in Lightning Experience. When you’re ready for users to dive into Lightning Experience without looking back, you can move them to the new interface without the option to switch back to Salesforce Classic. See Make Lightning Experience the Only Experience. With the right users set up for Lightning Experience, you’re ready to go live. Fortunately, it’s easy to turn on Lightning Experience using the Lightning Experience Transition Assistant. From Setup in Salesforce Classic, click Get Started in the Transition Assistant tile at the top of the menu (1). Select the Roll Out phase (2). Click Launch Lightning Experience to expand the stage (3). Click the button next to Turn on Lightning Experience (4). That’s it! The users you’ve enabled and set up to immediately switch to the new interface automatically start enjoying Lightning Experience when their current session refreshes or when they log in. 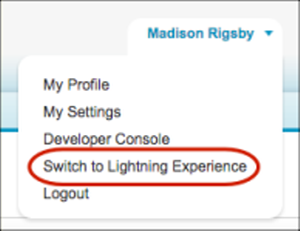 The users you’ve enabled but opted to leave in Salesforce Classic now have access to the Switcher and can switch to Lightning Experience whenever they want. Ideally, Lightning Experience meets the needs of everyone in your org. But just in case someone needs access to a feature or tool back in the classic interface, we provide the Switcher. By default, users enabled for Lightning Experience automatically get the Switcher. Which they can use to...wait for it...switch between Lightning Experience and Salesforce Classic whenever they need. The Switcher is smart. Whenever you switch, it remembers that user experience as your default preference. So if you switch to Salesforce Classic, the classic interface becomes your default preference. If you switch back to Lightning Experience, the new interface becomes your default preference. And so on and so on. How do you get to the Switcher? In the Lightning Experience header, click the profile picture and select Switch to Salesforce Classic. Switching between Lightning Experience and Salesforce Classic affects the underlying URL routing logic and can lead to some unexpected results when links are resolved. There can be snags with bookmarks and sharing links in emails or Chatter posts—especially if only a subset of your users is enabled for Lightning Experience. If a user clicks a link to something that’s not supported in Lightning Experience, Salesforce switches to Salesforce Classic in a new tab while the original Lightning Experience window stays open. Users who aren’t enabled for Lightning Experience can’t access Lightning Experience links, including links posted to Chatter or emailed from a Lightning Experience user. Keep all members of a functional team on the same experience. If you have team members who often share links and work closely together, include them all in the pilot. Remember, you can roll out Lightning Experience to a specific set of users using profiles or permission sets.